When two senseless killings hit close to home, columnist Clarence Abernathy seeks revenge for the murders—and, ultimately, answers to his own struggles regarding race and faith. After being dragged into the world of inner-city gangs and racial conflict, Clarence is encouraged by fellow columnist Jake Woods to forge an unlikely partnership with a redneck homicide detective. Soon the two find themselves facing dark forces, while unseen eyes watch from above. This re-release of Randy Alcorn’s powerful bestseller spins off from Deadline and offers a fascinating glimpse inside heaven. Can One Man’s Search for Justice Stand Up to the Forces of Evil Threatening to Destroy Him? A shocking murder drags black newspaper columnist Clarence Abernathy into the disorienting world of inner-city gangs and racial conflict. In a desperate hunt for answers to the violence (and to his own struggles with race and faith), Clarence forges an unlikely partnership with redneck detective Ollie Chandler. Despite their differences, Clarence and Ollie soon find themselves sharing the same mission: victory over the forces of darkness vying for dominion. 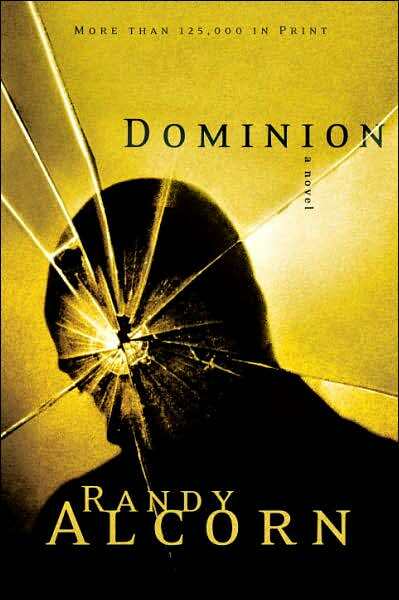 Filled with insight—and with characters so real you’ll never forget them—Dominion is a dramatic story of spiritual searching, racial reconciliation, and hope. I enjoyed it but this type of book is not really for everyone… there was a LOT in it about racism and judgement. It was also interesting because it took place in North Portland and there were references to places I’ve been recently when I visited Laura and Devin!